The Telesto, like its big brother Tigris, descends from the Reference speaker Titan Tethys. The Telesto is a slim and striking entry to the Titan series. Telesto is the result of 5 years intensive development and the natural continuation of the research that began nearly 25 years ago with Joseph Sahyoun’s dream of the perfect loudspeaker. During the development of the original Titan, it was recognized that the combination of individually uncompromising units failed to achieve the homogeneous perfection and true to life reproduction Joseph so ardently desired. Titan Telesto - Challenge it. Titan Telestos exterior surface is made of deep luxurious black glossy piano lacquer. The elegant finish complements the iconic design and sculpturally adds sophistication and exclusivity to any home. Titan Telesto - more than sound. principles. The Hemi Elliptical design reduces reflections and standing waves which ensures a transparent, dynamic and neutral reproduction. The Telesto Hemi elliptical cabinet is built using the Earthquake proprietary N-Flex method. Layer upon layer of steam bent wood are adhered together with no loss of structural thickness and rigidity resulting in a superior cabinet. Each layer is in fixated for 60 min before the next layer is added. A uniform thickness of 30 mm is achieved by 8 layers of steam bent HDF (high density fiberboard). This thickness is constant and not compromised by grooves or foam. T1 super tweeter resides in its own Stilla-Sphere housing on top of Telesto. This location provides optimum dispersion, minimal interaction and a stable sound stage. T1 is phase tuned to work uniformly with the Super midrange M2. It has traditionally been difficult to get a separate super tweeter to work homogeneous with the rest of the speaker. This is overcome by the synchronous development of the drivers. Their dispersion and energy constant is synchronized so they appear transparent as one unit. T1 super tweeter is based on a silk dome diaphragm resulting in precise, soft and fatigue-free reproduction. The silk dome is Accumax coated which retains the excellent audio properties of pure silk while eliminating the mechanical break-up inherent in pure silk at higher frequencies. T1 has a very powerful motor system based on a rare earth neodynium magnet. This construction ensures a uniform and stable response and tonality regardless of frequency and volume. The unique M2 super midrange is the result of Earthquakes Hybrid Phase Corrected Parabolically Loaded Compression Driver Technology using the PLD (Parabolical loading device). 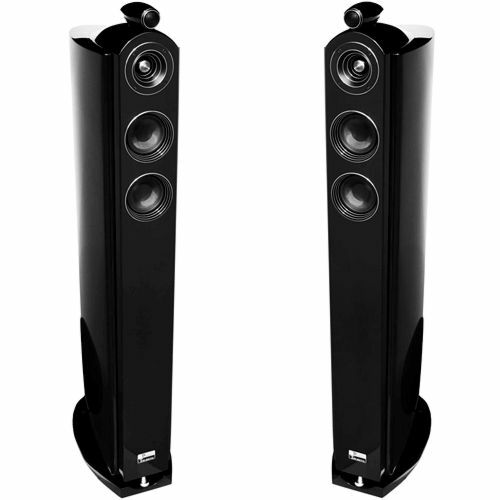 The advanced design solves several longstanding challenges in loudspeaker design. And its increased upper frequency response ensures perfect transition to the T1 super tweeter. the M2 super midrange overcomes these challenges by having a very controlled dispersion, perfectly matching the T1 super tweeter. The unique design also allows the cone diameter to be kept at 1.25 inch, making it fast and articulate. It is this speed and thus increased upper bandwidth that categorize M2 as a super midrange. The M2s high-tech design has many advantages. Its fundamental design elements eliminate problems that traditionally have been tried solved by way of refinement. Here they are genetically removed from the design resulting in a detailed and completely compression free sound - so unhindered and shackle-free that sound exits the speaker almost as if it was lightening. The parabolic loading, has many of the advantages known from typical horns, without the horn artifacts and inherent sound characteristics. The drivers coupling to the air is increased by the parabolic loading, which increases sensitivity. Optimization and strict control of air impedance in the parabolic dish ensures maximum coupling without tonal shift or hardness. The aerodynamic Phase-Corrector in the middle of the parabolic dish ensures proper phase and accurate dispersion control.The M2s dome is made of Accumax coated silk, ensuring an accurate and organic reproduction. Often, compression drivers made with metal cones, this can give a hard sound because the sound is reproduced by metal and then acoustically amplified by metal / hard surface through a horn. The M2 compression driver design has a significantly milder compression factor / acoustic multiplier, which coupled with the silk dome results in dynamic and artifact free sound. 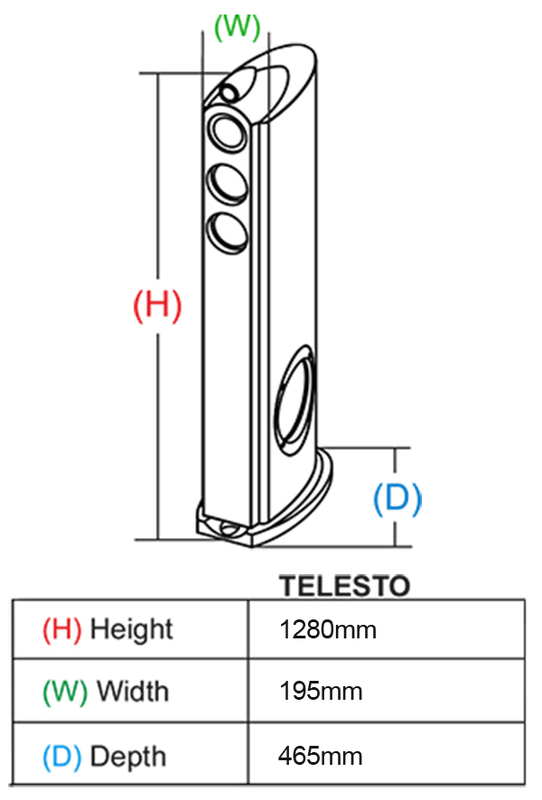 Telesto is equipped with 2 M4 bass-mid tone in a Vertical Line Array setup. The Line-Array configuration optimizes the radiated energy and concentrates it within the desired dispersion field. The properties of the vertical line array are reinforced by the special Earthquake CALA pods (Concave Audio Lense Apparatus). Like the parabolic dish in the M2 Super midtone the Audiolense pods guides the sound. This dispersion control ensures the most accurate integration of the drive units. The M4 bass-midrange is a 4-inch long-throw driver with a ballistic grade Kevlar Cone. To ensure a perfect and seamless transition from the M2 super midrange and a solid hand-off to the XLT-8 subwoofer driver, a very fast and light bass-mid range is needed. Kevlar was invented by the Dupont Corporation in the early 60s and have been used in loudspeakers for many years because it is light, rigid and anechoic. These advantages come with their own set of challenges, Kevlar is expensive and difficult to integrate which is why you often see a low-grade Kevlar (low-thread-count) used in loudspeakers. By using a low-grade Kevlar most of its special properties are lost. The M4 bass midtones use the highest ballistic grade Kevlar. The cones are lightweight and extremely rigid guaranteeing pistonic behavior far beyond their crossover point. Kevlar is an aramid fiber and is very sensitive to moisture and absorbs moisture if not specially processed. The Kevlar cone constructed by Earthquake undergoes a special epoxy evaporation process making the Kevlar invariant to moisture. The M4 units are of the Long-throw type. It is somewhat unusual for a bass-midrange to be designed using the long-throw geometry, especially when it is crossed at 350 Hz which equates to the unit rarely being exposed to low frequencies that could exploit the long stroke. The great throw potential is obtained by useing high Santoprene edge suspension and the Special Earthquake Super Spider centering unit, and a voice coil with a winding height of nearly 2 cm. Several unique benefits arise by the use of the long-throw design in the M4. Since only a small portion of the large throw potential is needed, the unit can be designed so that the suspension compliance is unchanged within the unit's actual travel. It overcomes any kind of CMS compression found in typical drive units. The Unit's suspension is so compliant that it easily moves if you blow on it. The high voice coil winding height combined with an oversized strontium-cobalt magnet system provides a strong electromotive interaction which keeps the unit in an iron grip. Since the device can move more than ever required, the travel will never be hampered by the suspension. This means that it is always the electrical impulse that controls the cone. It ensures that the distortion caused by mechanical self-braking will never arise. Telesto is equipped with Earthquake’s XLT8 (Xtra Long Throw) woofer mounted in the side of the Telesto tower. The XLT-8 woofer is a variant of the woofer that has excelled Earthquake’s MiniMe P8 subwoofer as the market's most powerful subwoofer in its size class. With thunderous response linearly down to 30 Hz, many find a subwoofer utterly superfluous. XLT-8 woofer is constructed using Earthquakes XLT geometry which is an evolution of the generic long-throw architecture. The cone is a composite of cellulose and fiberglass which is characterized by being lightweight and rigid. High Santoprene surrounds and Super Spider results in excellent mobility. An over-sized copper voice coil coupled to a strong strontium-cobalt magnet system result in an articulate and detailed bass response. The strong electromagnetic interaction between voice coil and magnet results in a very high reactive impedance. This guarantees that the energy is converted into motion and not heat. This avoids heat derived compression. The Telesto bass response stays accurate and taunt regardless of complexity and listening level. Indulge your senses with the Titan Telesto. 1 "silk dome tweeter with neodynium magnet. 1.25" horn-loaded silk dome midrange. Two 4 "Ballistic Grade Kevlar bass-mid . Stilla-Sphere cabinet to the tweeter. Frequency response: 25 - 40.000Hz. Recommended amplifier power: 100 to 500 watts.